Unless you have been living under a rock for the past week, you probably know all about the Motorola Cliq (and all of the speculation and confusion surrounding it). 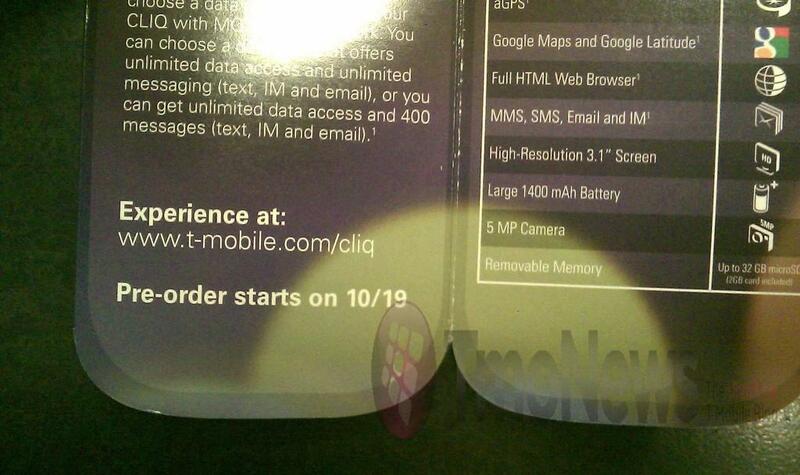 Well, while some seem certain that the next Android phone will be hitting T-Mobile stores early next month, we will be standing by our previous October 19th pre-order date. Why? Well, because we have our second form of visual proof. It comes in the same manner as the first, a promotional fold out with a date at the bottom, but this makes two. This second batch of offerings includes more pages of the hand out. I would also like to point out that an October 19th pre-order would probably lead to a November 2nd sales date, which links up nicely with that leaked slide. Head on past the break to compare the different versions and view the full foldout. Don’t forget to tell us what you think in the comments! Nov 2? That’s my birthday! Present for myself! w00t! I will be getting this phone!!!! I can’t wait!!! I asked my tmo rep if they had anything tangible on the phone yet and he said no then pulled about 50 of those foldy phones out of a file cabinet. I made him give me a couple. He acted like he wasn’t supposed to. Mine doesn’t have the pre order date. How close is the info card to actual size? Slightly smaller? 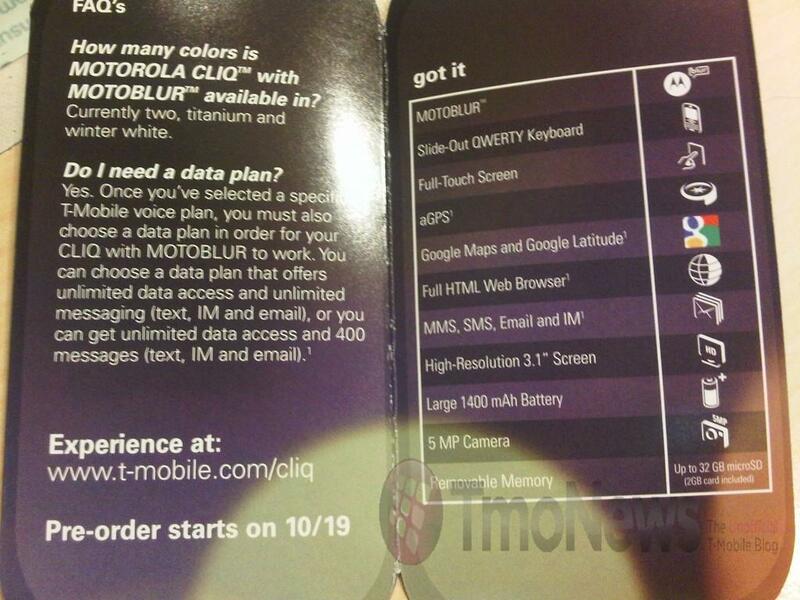 I was in my local t-mobile store and seen this fold out all the stores have it they are just not showing it to anyone. Whats the deal with the 400 messages and data plan there is the note #1 next to it but no explanation if they are bringing it back. Seems like a good deal no matter how you paint it. 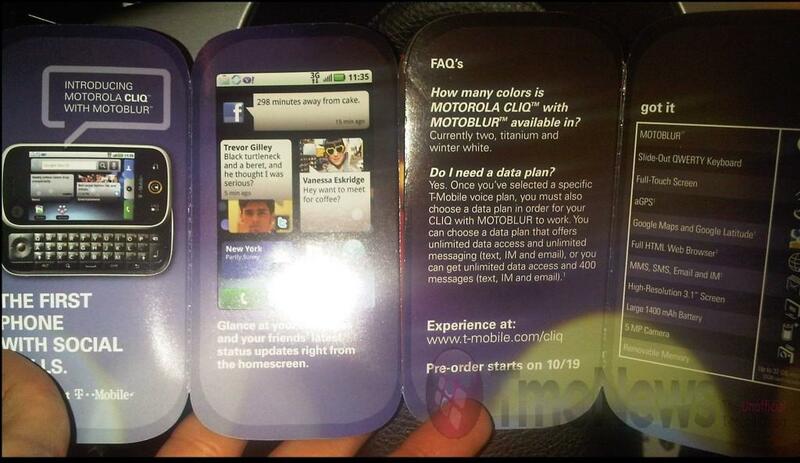 so accordin to the pics, they are bringin back the $25 data plan with unlimited data and 400 messages? Yay. My sidekick has been crapping out on me so I really need a new phone. Does anyone know if the miracle of this phone being free on contract is true? Why is the data plan required? This phone has WiFi, doesn’t it? It’s not as convenient as a data plan, but for many people it would be enough. I had no idea the 400 messages included email and IMs. I can keep under that for texts, but who could do that for emails AND IMs. Useless. Hey mattlennix, the My Touch is LITERALLY the G1 without a keyboard. My sister and Mom have it. I still have the G1. Almost updated but waited a while for my Sister who also had a G1 to have it for a couple of weeks. Don’t get me wrong. The G1 is cool but the hardware is a dinasaur. 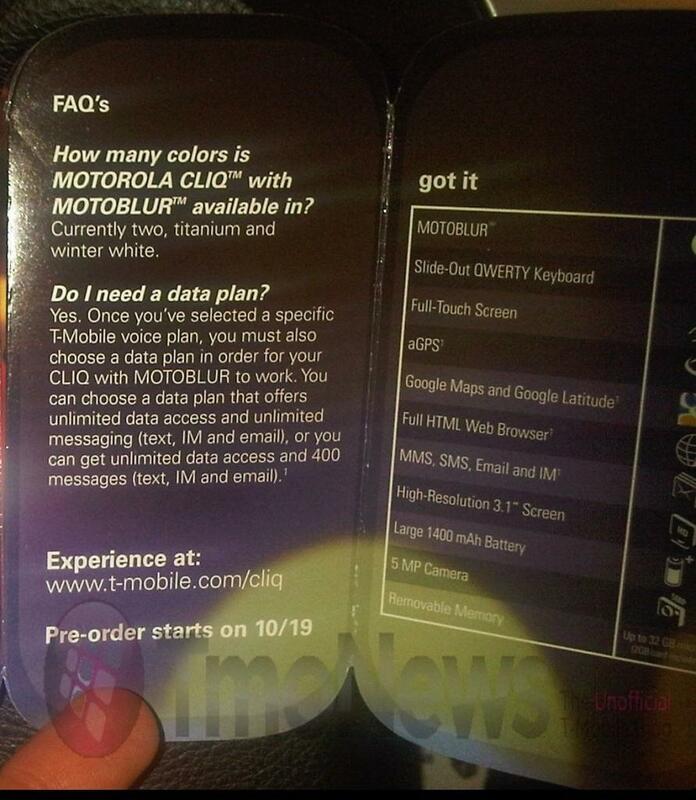 If you haven’t already, take a look at the MOTOBLUR explaination on Motorola.com. This will help you wait. Cliq is a much better phone all the way around. How Much is the Cliq?